Thank you so much for stopping by, lovely to have you here. My name is Irene. Sugaridoo is the place where I share everything about my crafty life. I just love creating things! I like sewing, quilting, crocheting, cross stitching, baking, actually, I like everything that is about making stuff. Just like my mom and granny I started with crafts when I was really young. Can’t really help it, it’s in my genes my mother told me ;) Just looking at pretty colorful yarn or feeling smooth cotton fabrics make me so happy! 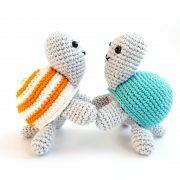 In 2013 I started my own Etsy and Craftsy shop to sell amigurumi patterns. I surely did a happy dance (or two) when I got my first sale. Just perfect to be able to support my craft supplies by selling my designs to the world. 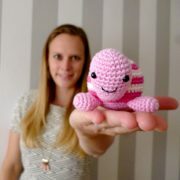 So lovely to see that someone in Denmark is crocheting Mike the Monkey! May 2016 I decided that I wanted to give Sugaridoo a chance to grow. So I did something crazy and quit my day job in Juli this year. Whaa such a exciting thing to do! So now I’m a fulltime blogger / crafty designer. I can’t wait where this adventure is going to bring me. And I’m going to share everything I learn along the way with my crafty friends here at Sugaridoo. I love to hear and see what you make and would be happy to answer your crafty questions! Just send me a note, email, tweet, comment or insta message (or a homing pigeon, that’s also ok) and I’ll get back to you. Have a wonderful day, and Happy crafting!